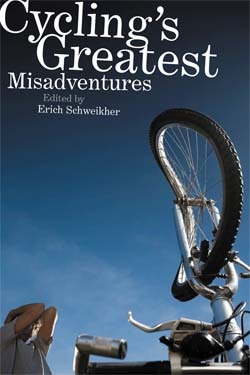 From now through Christmas Wilderness Press is offering a buy-3-get-1-free special on the book Cycling's Greatest Misadventures. To order call Wilderness Press at 800-443-7227 or 510-558-1666 and give them the code Cycling2007. Take advantage of this $68.00 retail value for only $28.00 plus shipping. Cycling's Greatest Misadventures presents twenty-seven true stories which cross the spectrum from terrifying to comical to downright bizarre. In these pages both everyday riders and pros tell their stories of freak accidents, animal attacks, sabotage, idiotic decisions, eerie or unexplained incidents, and other jaw dropping, adrenalin-pumping calamities. These stories bring to life the strange possibilities that await us once we step on the pedals of our road, mountain, or commuter bikes.